João Louro, Ulysses, 2014, acrylic on canvas, 67 x 52”. “The image is strong but next to it is the void,” reads a phrase in a recent work by João Louro. The statement may well be an axiom for the artist’s overall practice, which regards the image as an entity in itself and probes the space that surrounds it. Central to this process is the presence and absence of images and the role the spectator has in activating or reinventing them. In Lisbon, Louro presents two simultaneous exhibitions—one at the eighteenth-century chapel of Projecto Travessa da Ermida and another at Cristina Guerra Contemporary Art—that postulate separate takes on our relation to the construction and observation of imagery. In “5 Minutes After Violent Death,” a speculation on the last images one will see just before death is presented. A group of twenty small black-and-white photographs and three large color light boxes—each with the same title of the show and dated 2014—from Louro’s personal archive suggest a hypothetical, filmic flashback of the entirety of someone’s life: sweet childhood moments, beloved movies, personal encounters, and memorable holidays. Though they are dispositive for the viewer’s own personal recollection, there are moments when the artist barely hints at a certain narrative, forcing the spectator to complete the picture. In the gallery space, “The Cold Man” includes twelve canvases from the series “Covers” and the installation The Atomic Nature of Matter, both 2014. Comprised of a written introduction by a mysterious author and a series of documents, such as a personal journal, police facial composites, photographs, and newspaper clippings, the installation presents the story of a fiction writer who becomes a serial killer and murders to feed his stories. 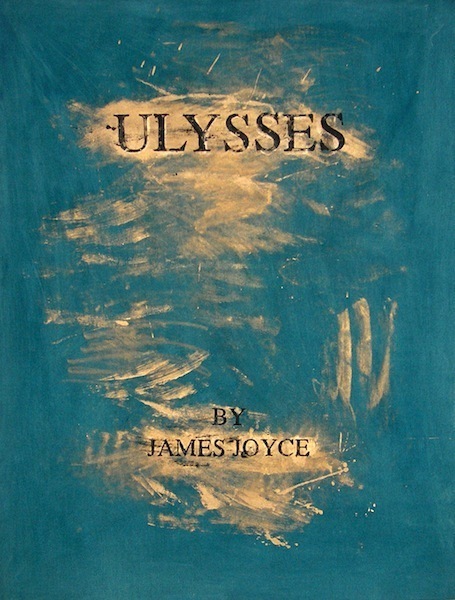 The paintings, however, are reproductions of recognizable book covers: In Ulysses, for example, Louro reproduces the cover of the book’s first edition but violently erases part of the blue background that makes up the Aegean Sea as if to unveil only the title and the author’s name. By denying access to the contents of the book, the paintings serve as triggers for the spectator to either imagine a new narrative or retell the classic stories by memory—much like seeing your life flash before your eyes.